Jimmy Alleva's Latest Album is Now Available! Visit our website http://jimmyallea.com/ ! Please feel free to enter your email address ('Follow by email', under "About Jimmy" on the right) so you are notified when we enter new postings. Visit our website http://jimmyalleva.com ! 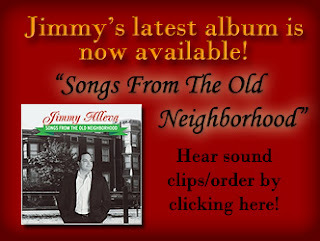 Be sure to visit our website at jimmyalleva.com for more information, show schedules, photo gallery, recording samples, link to purchase Jimmy's CD's and more! !